How Amunsden knew he was on the south pole? Re: How Amunsden knew he was on the south pole? Do scientists claim that there are two magnetic poles? Okay, well then someone should be able to provide evidence of a compass that points South. EVERY single compass points North. There's a reason why, look into the real meaning behind Mercator and the magnetic mountain. The distorted focus and dissonance is a result of the incorrect focus on the Antarctic, we should be looking at the North "pole". Every compass points south! Every magnet we know (so far) has two poles that we choose to call North (or North-seeking) and South (or South-Seeking). We've been studying magnetism in fifth grade. We want to know what will happen if you bring a compass to the South Pole. We think the needle will rotate 360 degrees multiple times because when you are at the South Pole you can go any direction and still be going north. The South Magnetic Pole is not even within the Antarctic Circle. And Magnetic Compasses are routinely used for navigation around Antarctica! But what this means for your question is that if I had a compass here at the geographic south pole, the back part of the needle would point in the direction of the magnetic south pole, and the front part of the needle will point towards the magnetic north pole. Even if I spin around, the needle will always stay pointed in the same direction. Guess what...This answer is wrong...Geometrically impossible!!! Isn't it? The guys answer is close to being correct! And you are talking absolute rubbish. Especially as the Magnetic South Pole is not even close to the Geographic South Pole. On March 1 2016 the Declination and Inclination at the South Geographic Pole are: D = -30.212 deg I = -72.233 deg. I wish you would stop talking through you hat about subjects you know nothing about! 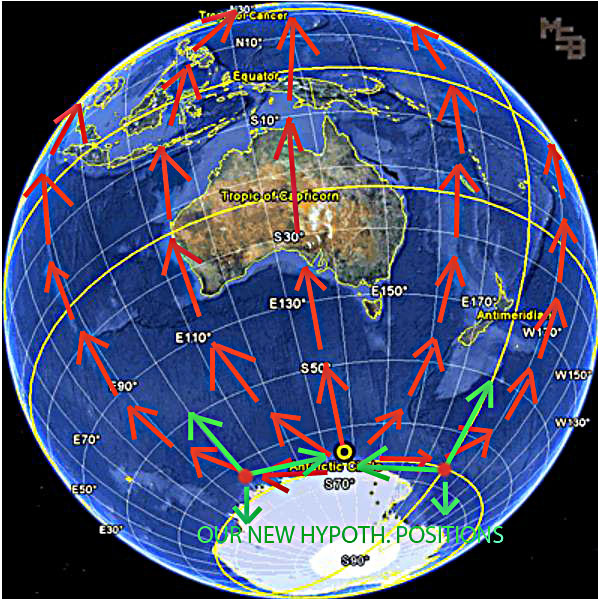 I don't have to explain why it is geometrically absolutely impossible to draw a straight line (ON THE FLAT EARTH MAP) between two magnetic poles and then try to apply above given scenario-answer to this (flat earth geometry) situation. That goes without saying. It's "geometrically absolutely impossible to draw a straight line" on something that doesn't exist. "The flat-earth map" doesn't exist. Because the earth isn't flat. The white end points toward the South Magnetic Pole, red end points toward the North Magnetic Pole about halfway around the world away. Magnetic north is the opposite direction as magnetic south. Same as always. Is this really that hard to understand? Note that this location has close to, or exactly, 180° magnetic declination. This means that magnetic north is true south, and magnetic south is true north. This happens whenever you're directly between the magnetic and the geographic poles. I mentioned my experiment to a guy I met from Australia. He said, "Of course they pointed north. A compass will point north unless you sitting on the South Pole..."
He's wrong. It points North EVERYWHERE. As others mentioned, it might be pointing DOWN at the South MAGNETIC Pole (not the Geographic Pole) but it will ALWAYS point towards the North MAGNETIC Pole. I have no idea how explorers, sailors, or anybody else found their way around before the days of radio, inertial, and GPS reference systems when there could be weeks or months when the sun and stars were not visible. Overcast skies were not the only hindrance to celestial navigation but the persistence of the weather often revealed something about their location. Accurate time is essential to most of the navigation resources in the heavens. Their power of perception probably rivaled that of birds, insects, fish and animals. I wonder which I'd prefer, the power of their perception or the power of today's technology. Still, lots of ships were lost at sea or grounded but even today's technology hasn't prevented that. Shackleton's 800 mile sea jouney for survival is a more contemporary example of remarkable celestial navigation with little more than primitive methods. THE compass did not belong to him. But when he felt it in his trouser pocket—and with every stride of his skis over the Antarctic ice, he felt it—it powered him on. When the light was flat, crevasses lurking and nothing before him but “white darkness”, he remained aware of it, his silent companion. If team morale was low in the tent in the evenings, with socks drying at head-height and the winds hurling outside, he would pass it round. It was not much bigger than an old penny, but alive, spinning and jittering, as excited as he was to be so close to the South Pole. For it had been there before, a century earlier. Inside the lid the owner had scratched his initials: EHS, for Ernest Henry Shackleton. Yet there was a Shackleton compass in his head in any case. Your drawings are wrong. They don't accurately depict reality. "Just got back"? Your post makes it sound like you were doing these things recently, which is incorrect on two counts: it's not you, and this was years ago. That paragraph is copy-pasted from a post containing a copy-paste from someone else's even earlier narrative. If you're quoting from some other source, make it clear that it's a quote, please. Just putting quote marks around the copied text would be helpful. At any rate, the Main Field Declination in eastern Tierra del Fuego is about 12° E according to the WMM (pdf) - that means that magnetic north is about 12° east of true north, so I'd expect the compass needles to point close to true north. It might have been nice if the photographer had aligned the compass bodies and dials with true north before taking the picture, but apparently they're in some random orientation. He probably doesn't know how to use an orienteering compass. That depends on whether you mean magnetic north or true north. Magnetic compasses always point toward magnetic north[nb]Well, almost always... as noted, right over a pole will have the needle trying to stand on end. [/nb], but sometimes, near the magnetic poles, magnetic north is in a wildly different direction than true north; in some places it is 180° off! On his three expeditions to Antarctica, in 2008-09, 2011-12 and 2015-16, Henry Worsley went equipped with GPS, video cameras, satellite phones, solar panels, energy bars. No item was more important than the compass. Yeah. 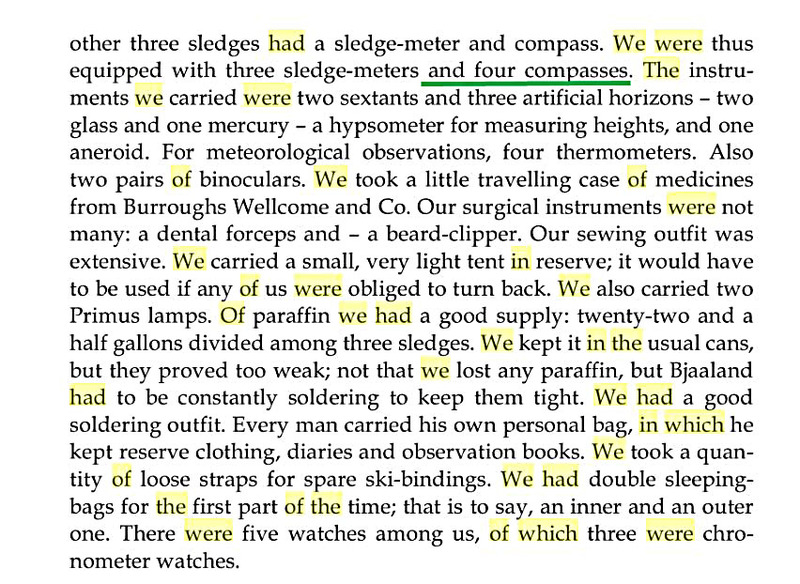 Shackleton's compass was important to Worsley for inspiration, not navigation. Read the text you quoted. Then you go on about geometrical impossiblity, etc, etc. Well "technically", a straight line from the South Magnetic Pole to the North Magnetic Pole is through the globe, but we all know that a compass needle does not point "from one pole to the other", but aligns itself to the local magnetic field. And, when we say the compass points to the North Magnetic Pole we do mean along the surface of the earth. Of course, the field is hardly anywhere horizontal and especially near the magnetic poles has a large inclination which (on better compasses) is compensated by weighting the appropriate end. Now, the question asked was: "if I had a compass here at the geographic south pole, the back part of the needle would point in the direction of the magnetic south pole, and the front part of the needle will point towards the magnetic north pole. Even if I spin around, the needle will always stay pointed in the same direction." And I answered that this answer was close, and it is! Take a look at the diagram on the right showing the South Magnetic Pole, South Geographic Pole and the direction a compass needle would point right at South Geographic Pole. Note that here the declination is -30.2° and the inclination is = -72.2°. At the South Pole, by convention geographic north is taken along the "Prime Meridian", so the compass points about 30° west of that, but still towards the North Magnetic Pole! (which is fairly close to the North Geographic Pole). The other end (south seeking end) of the needle can be seen to point fairly closely to the South Magnetic Pole. So, the original statement is quite close. All these are along the surface of the globe as any reasonable person would expect. Mind you a compass needle free to rotate in a vertical plane as well would point upwards at 72°. There are compasses designed to measure the inclination. Do you see where you are so wrong yet? Cikljamas, do you completely understand and comprehend the concept and difference between GRID cardinal directions and MAGNETIC cardinal directions? Do i see where i am wrong? No, i don't see where i am wrong. Do you see where you are wrong? 2. 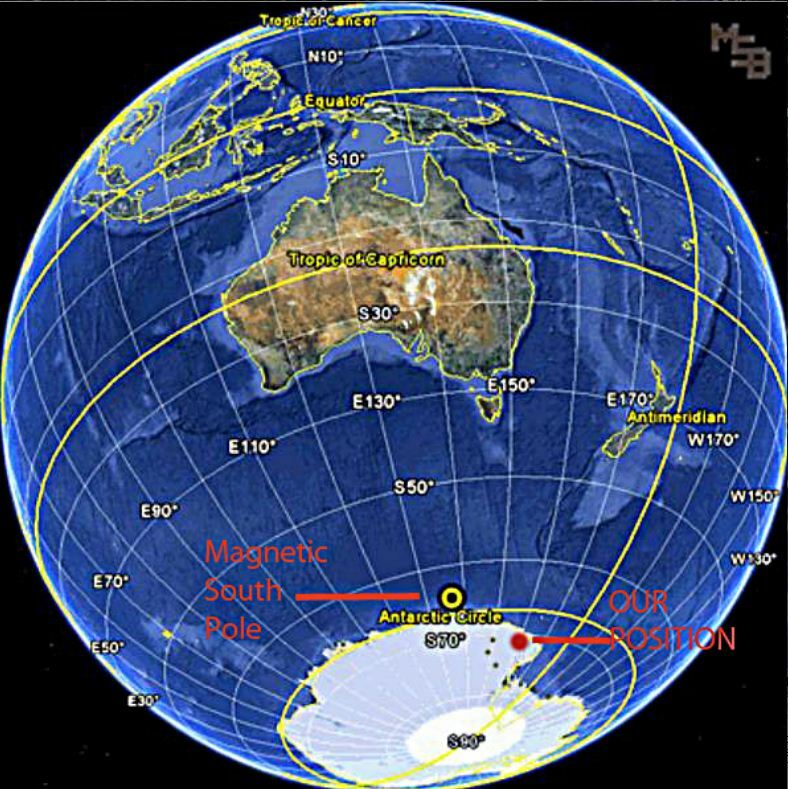 There are two magnetic poles on the flat earth - in this case every single point on the outer edge of the earth ("Antarctica") is South magnetic Pole. (this option can't be geometrically conciliated with RE claim according which only ONE SINGLE point (small region) in the vicinity of Antarctica represents/is South magnetic Pole. 3. There are two magnetic poles on the round earth and the shortest connection between these two poles is a straight line which goes through the center of the earth. In my illustration above i have demonstrated why this option is not geometrically consistent and sustainable. "OPEN YOUR EYES THIS TIME", sure they are open, now open up you closed mind a little! 1. There are NO known magnets with only ONE pole! If you have found one, front up for your Nobel Prize in Physics. 2. A magnet like this is possible, but as you say simply does not fit with the two magnetic poles we know are there. 3. 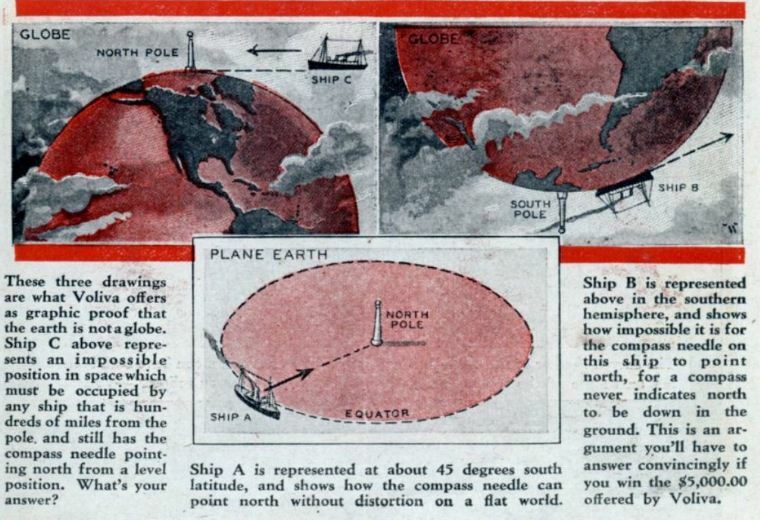 Sure: "There are two magnetic poles on the round earth and the shortest connection between these two poles is a straight line which goes through the center of the earth", but whatever is the great significance of "the shortest connection between these two poles"? - NONE at ALL! So (3) is "true", but is of absolutely no significance. The earth's "magnet" is roughly like a big bar magnet, and a compass does not simply "point to the north pole", but aligns itself to the local field lines and there is absolutely no significance to "the shortest connection between these two poles" so I cannot comprehend why you are raving over it so much. We live on the surface of the earth (in case you had not noticed!) and on the surface the compass needle does not simply "point to the north pole", it ALIGNS itself to (the horizontal component of) the local field lines. Yes, I'm repeating myself, in the hopes that in just might sink in - but I won't hold my breath. So quit harping on the line between the poles - it means NOTHING! If you were placed at the position designated in a diagram above and if one end of your compass needle pointed towards north magnetic pole, then other end of your compass needle would point in a direction which is under 90 DEGR. 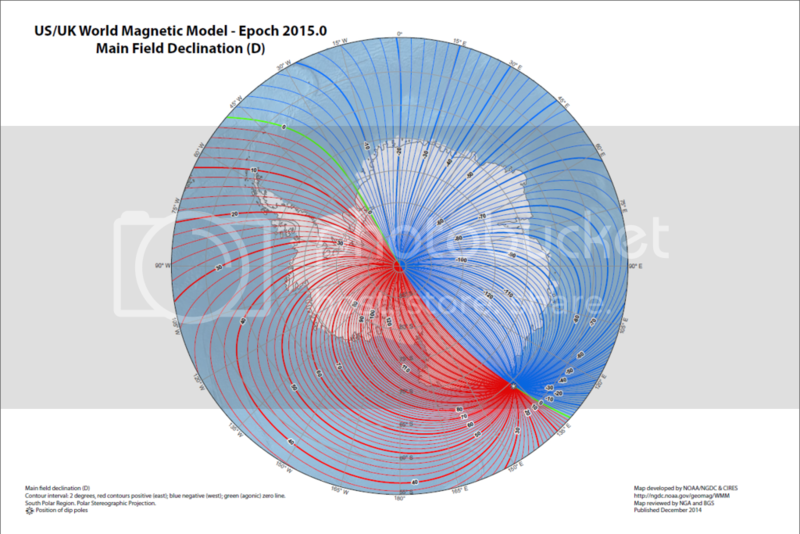 angle in relation to the alleged position of the South magnetic Pole. So, when you say : ----- "So quit harping on the line between the poles - it means NOTHING!" ----- it amounts to NOTHING (sane and meaningful)! When you say : ----- The earth's "magnet" is roughly like a big bar magnet, and a compass does not simply "point to the north pole", but aligns itself to the local field line ----- it amounts to NOTHING again, because you have to face the same problem which i have pointed out which is this : the direction (to the North magnetic Pole) in which one end of compass needle points is completely in discordance with the position of the alleged South magnetic Pole, that is to say : in discordance with alleged field line (which depends on the alleged position of the South magnetic Pole) which is designated on the left side of my illustration!!! As for this sentence of yours : ------ 1. There are NO known magnets with only ONE pole! If you have found one, front up for your Nobel Prize in Physics.------ i didn't say that ONLY TRUE magnetic pole (North magnetic Pole) doesn't have it's opposite side, only i didn't specify where it's other side is located. But you could assume that other side of the North magnetic Pole is located directly bellow (who knows how deep under the ground-since human beings didn't EVER reach deeper than 12 km ( " class="bbc_link" target="_blank"> )) the surface point at which we designate North magnetic Pole on our maps. Do i see where i am wrong? No, i don't see where i am wrong. Then allow me to help. In your illustrations below, you draw a red arrow from the point marked "OUR NEW POSITION!!! ", essentially due west, toward the South Magnetic Pole (SMP). You also draw a series of short red arrows pointing north along the 180° meridian (the Antimeridian). Further, there are a bunch of straight red and green arrows radiating from the vicinity of the SMP. Why the different colors? Are these supposed to represent the geomagnetic field lines? If so, they would curve (unless the SMP was centered on your projection, which it isn't[nb]This also assumes that the geomagnetic field is centered and a uniform dipole field, neither of which are strictly true, but for this discussion we can presume the difference is irrelevant.[/nb]). See how all the meridian lines and the Equator - all great circles - curve? Your radiating lines should do the same if they represent great circles. At any rate, that northward-pointing set of arrows, if it represents the direction of the north-seeking end of the compass needle, would point in the opposite direction of the red arrow pointing toward the SMP, in the direction between the lower two green arrows. Do you see where you are wrong? No. I hope you see where you are now. No. You drew it that way, but your drawing is wrong, that's all. The arbitrary north-pointing set of arrows is meaningless, so the "ludicrous geometry" you assert simply doesn't exist. Do you see why now? 4. The interior of the Earth acts, in general, like a bar magnet approximately centered in the Earth and approximately aligned with the axis of spin. Compass needles on or near the surface of the Earth align with the dipole field lines. Declaring that there are three possibilities doesn't mean there really are exactly three possibilities, as I hope you can now see. You omitted the one that most closely describes what we see. You already used that image almost a year and a half ago. It's still wrong. Closer, but why are there three arrows pointing away from the two positions you have picked? A compass needle is a straight line with two ends, not three. Why not a green arrow pointing toward the SMP and another arrow pointing in the opposite direction, away from it, and get rid of the two green arrows at each location pointing toward geographic north and another, apparently random, direction? At the locations you picked, geographic north is very different than magnetic north, and magnetic compass needles point toward the magnetic, not geographic poles. Also note that, technically, in this illustration, the arrows representing the compass needle should be aligned tangent to the curved line traced by the red arrows through each point, not directly toward (and away from) the SMP, but the difference is relatively small. The difference is not small, because at the locations which i picked (and at many other locations which i haven't picked so far, but which i could pick as well) compass needle can't point towards both (one of which is only ALLEGED one (south magnetic pole)) magnetic poles SIMULTANEOUSLY!!! - That's the whole point : it's geometrically impossible! Deal with it! If you were right, compass wouldn't work at half (at least) locations along the Antarctic circle! Show me AT LEAST ONE SINGLE AUTHENTIC TESTIMONY OF THAT KIND! Red contours indicate magnetic north is east of true north by the indicated number of degrees; roughly 70° on the case of Antarctic circle and Antimeridian. Blue contours indicate that magnetic north is west of true north; roughly 80° at 100° E and north of the Antarctic circle. [Edit to add] This figure is from https://www.ngdc.noaa.gov/geomag/WMM/DoDWMM.shtml. More specifically the zip file containing the complete pdf map set. Those declinations match pretty well with "tangent to the curved line traced by the red arrows" in your figure. Given the freehand nature of that drawing, well done! True. I certainly wouldn't call 70° and 80° of difference "small". If you look at how tightly those contours in the WMM map are packed, you will see the differences vary rapidly and greatly. compass needle can't point towards both (one of which is only ALLEGED one (south magnetic pole)) magnetic poles SIMULTANEOUSLY!!! - That's the whole point : it's geometrically impossible! If you were right, compass wouldn't work at half (at least) locations along the Antarctic circle! It's much worse than that!! On the Antarctic Circle, a magnetic compass will fail to indicate true north by from as little as 0° (that means there is no error at all) at around 30° W longitude, to up to 180° (that means it's exactly wrong!) somewhere between 135° and 140° E longitude. 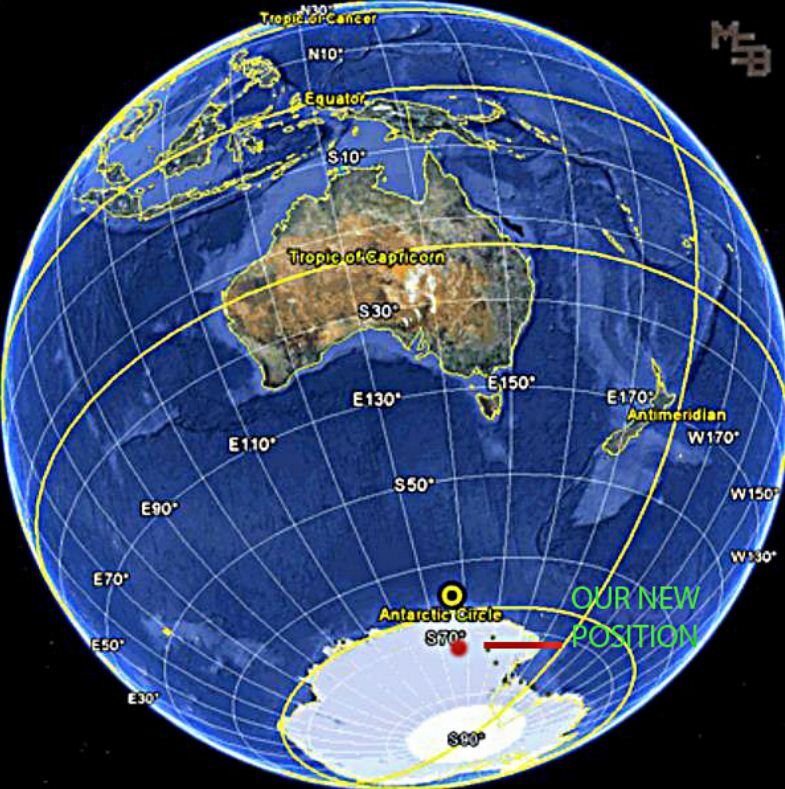 It will point within 20° of true north only about 1/9 of the way around that Antarctic circle! Show me AT LEAST ONE SINGLE AUTHENTIC TESTIMONY OF THAT KIND! Do you deny that this is authentic? Let me remind you that you were the one who first posted this. Alpha, your diagram doesn't prove anything (it's just one of those stupid cgi photos). Normally, geographers label Antarctica by East and West. West is on the normal left half of a map with the Peninsula at 10:00 and McMurdo at 6:00. However some journeys to the south pole seem to start at 12:00. 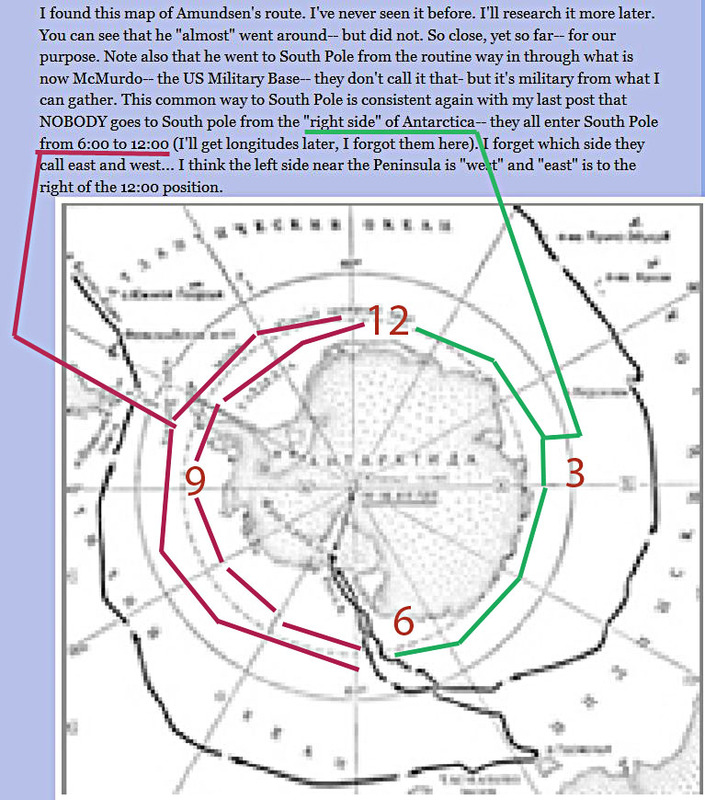 NONE seem to originate from 12:00 to 6:00 considering Antarctica as a clock circle. Now why should that be? I'm of the opinion that GPS is not a satellite system- just another type of radar. But look at the number of radar installations all over Byrdland. What's going on here? And why are there none on the other side? They say they're measuring earth tremors. But is that a cover story? Is this part of a massive security system to keep out intruders? Sophisticated burgle alarms? Motion detectors for people rather than earthquakes? I never claim any of this stuff "proves" anything. It does emphasize what you said earlier, though, so I thought you'd appreciate that. Oh, well. What about the "whichey-way" (triad) compass points on your earlier image? Did you ever say what those were about? Based on your underlines in the text, he mentions having them, and examining them occasionally. The only time he specifically says they would have been good to take (because if you're simply trying to retrace a route, it doesn't matter if they are pointing near true or not... you just follow the opposite direction back) they were "unsuitable". That sounds like a problem to me. What? What does that have to do with Amundsen and navigating to the South Pole? That's a really crummy image of the map. At any rate, Amundsen approached the pole from the opposite side of the Ross Ice Shelf from Ross Island (where McMurdo Station[USA] and Scott Base[NZ] are now). If you compare the heavy black lines on the upper image with the location of McMurdo on the better, lower, map, you can see that. Scott set out from Ross Island, and Shackleton had his base there, too. The original author doesn't know what he's talking about. And, no. McMurdo Station is not a military base. The NY Air National Guard (ANG) provides aircraft logistics (the US Navy did when I was there decades ago) and there are some ANG pilots and support personnel there, but McMurdo Station is open. It's populated mostly by scientists and support contractors. Now why should that be? I'm of the opinion that GPS is not a satellite system- just another type of radar. That may be your opinion, but it's wrong. But look at the number of radar installations all over Byrdland. There are none on your map. What's going on here? And why are there none on the other side? They say they're measuring earth tremors. But is that a cover story? Is this part of a massive security system to keep out intruders? Sophisticated burgle alarms? Motion detectors for people rather than earthquakes? Nothing more than the usual conspiracy claptrap. Nothing to see here, folks... move on. Why did so many of the early expeditions to the Pole start out from the Ross Sea? Look how much closer the coast is to the pole there? Plus, more of the trip is at near sea-level elevation, where it's warmer and easier to work. Simple, really. 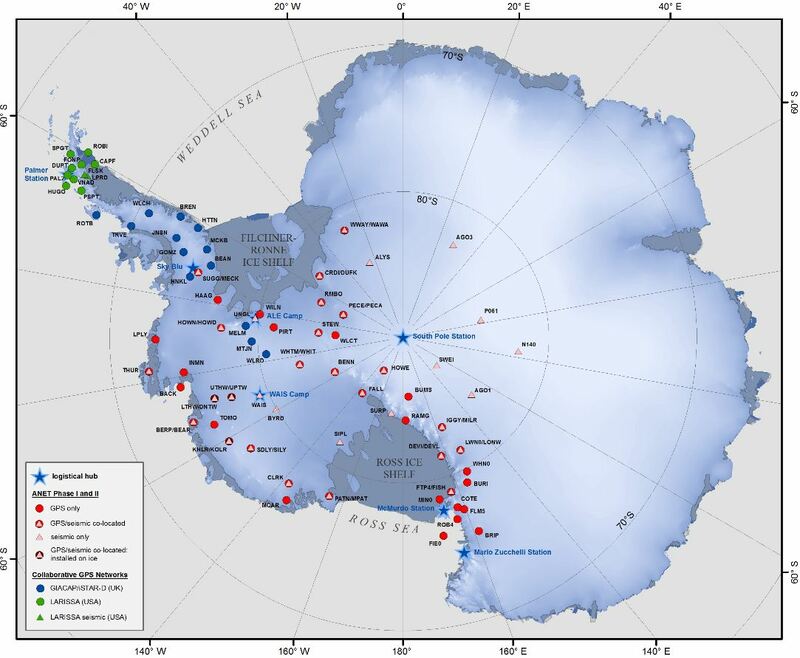 Most of East Antarctica is at quite high elevation and is still difficult to get to and live on. Sorry it's pure practicality and not something more sinister. Is that the video where he talks about unexplored areas "beyond the pole"? That's already been addressed elsewhere, but I don't have time to find it for you right now. Maybe you could use the site search for the ID code. 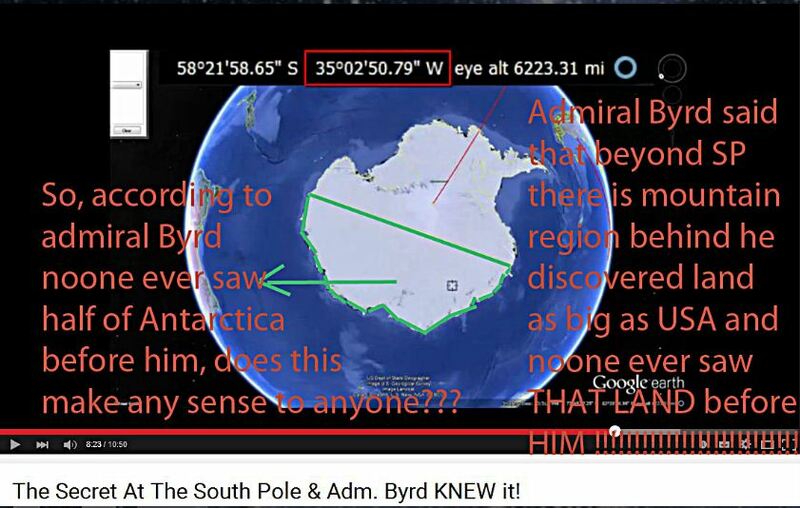 Please if you wouldn't mind, do a research on Admiral Richard Byrd. He went to the South Pole, because he was a naval officer certainly with an authorization, otherwise the US government would have not permitted him to do so. Basically if anyone approaches Antarctica there are US and other countries ships guarding the territory as he said. "We are crossing over the small mountain range and still proceeding northward as best as can be ascertained. Beyond the mountain range is what appears to be a valley with a small river or stream running through the center portion. There should be no green valley below! Something is definitely wrong and abnormal here! We should be over Ice and Snow! To the portside are great forests growing on the mountain slopes. Our navigation Instruments are still spinning, the gyroscope is oscillating back and forth!" There is a lot more information regarding the case which you could easily access on the net. Now I don't know, because I can not know, if all this is a machinated thing since he had an interview, and then his diary was published. If it was in the interests of our governments for the information to not leak out, because they want to keep us manipulated, it is highly probable that the story is faked. And with this in mind, I wonder how all of our debates over conspiracies are allowed to happen in such easily accessible ways. 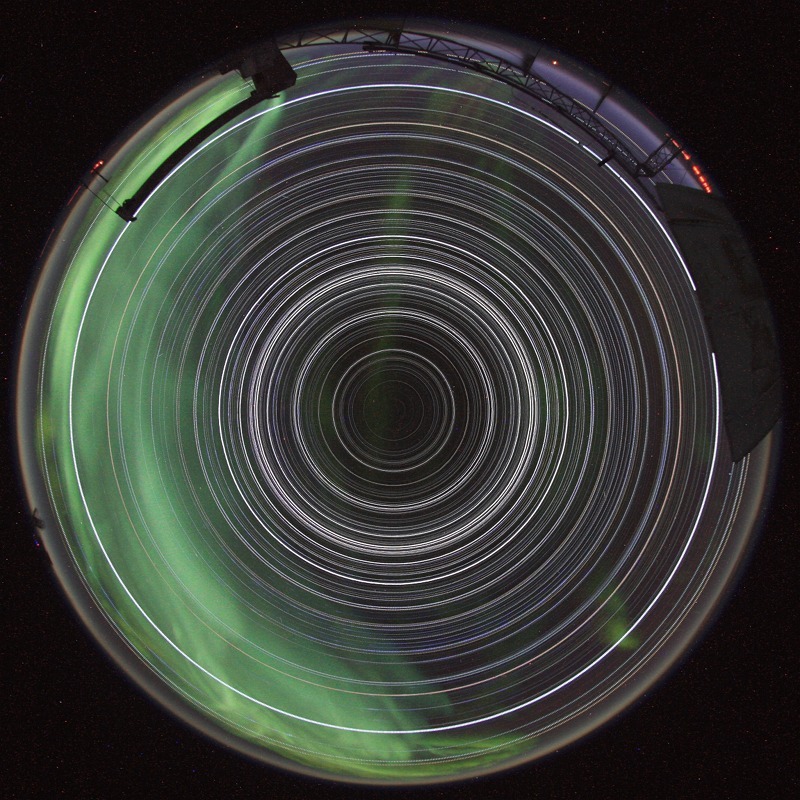 It's not as easy as you might think to take long time lapse videos at the south pole. To begin with you'd need to manufacture your own camera rotation device as well as find a way of attaching an external power supply so that the -50 temps didn't drain the battery too fast. Also, scientists and other base staff are limited in their luggage allowance to flights to the south pole, so packing a heap of specialist camera equipment is not really an option for them. Just because your new phone may have a time lapse app doesn't mean that you can just slap it down in the snow at the south pole and make quality sun following time lapses! Not sure if you're still interested in this question, but if you are I might be able to help you. You're trying to visualise how you can have a straight line from the magnetic south pole to the magnetic north pole, even if you're geographically west of it, right? This is a good question and took me a few minutes of drawing lines on an orange to work it out. I'm not sure if I can explain it in words, but you can do it for yourself if you'd like. Take a sphere, an orange works pretty well, use the natural axis on the orange as north and south magnetic poles. Using your map, add Antarctica and the geographic south pole. No matter where you position yourself in relation to the south pole, you can draw a straight line from it, through your position to the north magnetic pole, and it will also be the shortest distance from your position to the north magnetic pole. This appears counterintuitive, but, to my surprise, it works really well! This is a fun forum, if you keep asking the right questions you can learn a lot! Not to defend cikljamas but he has a point on this one. Drawing a line on an orange would make sense if the magnetic north and south poles were on exact opposite sides. Unfortunately they are not, and they are constantly moving to boot. Using the map he has as a reference, drawing a line straight from the south pole through what he marked as our position, you will end up several hundred miles from the actual position of the other magnetic pole. I made a quick image to demonstrate. As you can see the point on the exact opposite side from the South magnetic pole is in greenland some where. I didn't draw the line all the way to it, but you can clearly see that it doesn't touch the North magnetic pole. I also just realized he and I have labeled the magnetic poles backwards, the South magnetic pole is actually in the north and vise versa. Amundsen reached the South pole on December 14, 1911. His expedition used typical marine sextants and mercury artificial horizons (on land we use a dish of water or levelled "first surface" mirrors. Observations of the Sun began on the 15th 1911 and were taken every hour- which could be done since at that latitude (being about a week or so before summer) the sun never set. 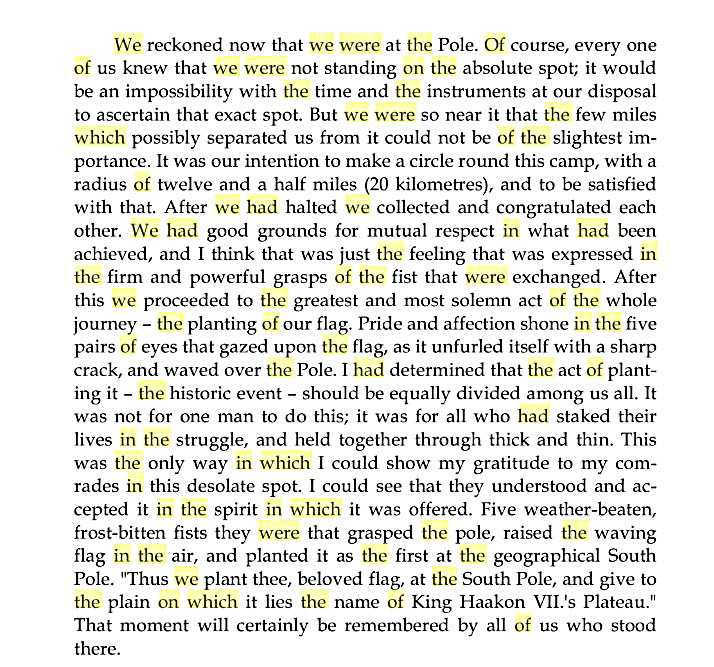 To avoid the doubt about reaching the geographic South Pole that troubled Peary (first to the North Pole), Amundsen's group "boxed in" the pole by traversing about 10 miles on either side of the estimated pole and taking observations (of the sun) from those points. Their reasoning was this- a sextant, at best, can only get you within 1 nm (1 nautical mile which equals 1 minute of arc) of your actual position so if they walked over the snow and ice in 3 points 90° apart from the route they followed to the pole then one the men would certainly have walked over the geographic South Pole. Compass is showing only one direction in amundsen: "still south". Amundsen is an Any trivial place in the world. It would have helped if Amundsen (not Amunsden) had arrived at the South Pole when it was not 24 hours of daylight for the 6 month summer period (which is impossible to explain on any other model), then he could have seen that the South Celestial Pole was perfectly 90 degrees above him. It was left to times when more accurate measurements could be made to adjust the actual south pole to its current position, but the first ones there did a remarkable job with the tools they had. Mr İntikam please learn something about the topic before you post your usual rubbish! What do you mean by "He wasn't"? That is quite incorrect! but as the previous poster told you, Amundsen used sextants to make sun sightings so that he knew when he was at the South Pole. 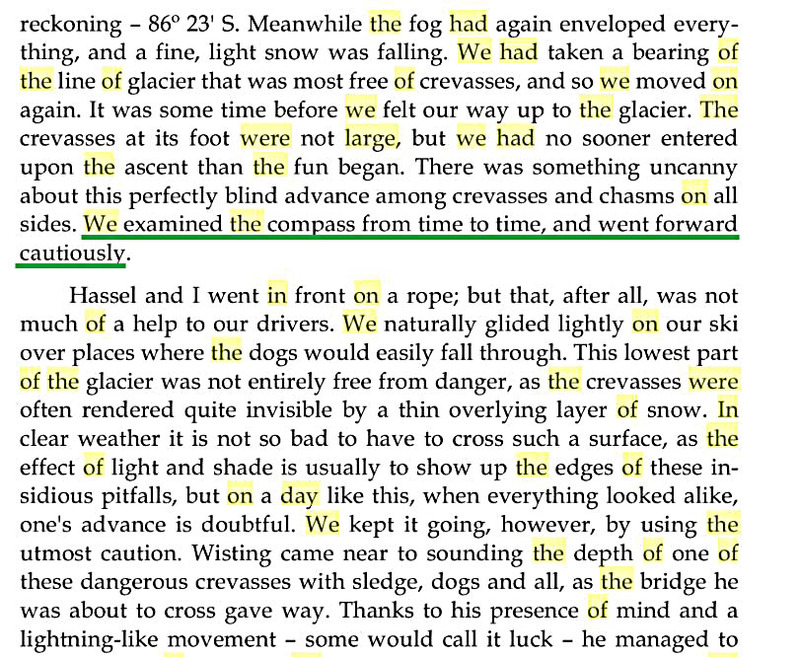 You might read Seale_J_Sup.Proj.pdf and learn what navigation instruments Amundsen used. Amundsen knew when he reached the South Pole. Fuckinoz is on my ignore list who is continuesly swearing me. I hope he wasn't quoted from me. I don't give a second chance to whores. They did nothing. Also today, there is no compass measurement shows that point as a poll. Compass is still showing anywhere else as south at there point. So Amunsden and his team were a liar, and the others too. I'm asking that, if that point is a pole, where is the compass experiment? Why isin't there at least one compass measurement at there. Shame on you, because of you join to the same lie! Intikam, look up geographical South Pole (not Poll) and magnetic South Pole. The first is fixed and is always right under the celestial south stars, the other one wanders due to the change in earth's magnetic fields. Here is what Amundsen could have seen if he was at the South Pole over a 24 hour time lapse period in its nighttime.